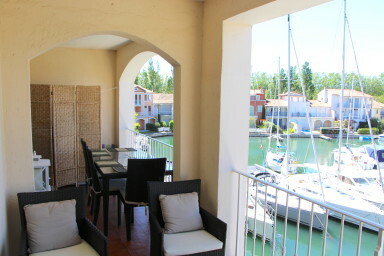 Pretty renewed 3-room apartment in a building with a lift located in a private area of Port Grimaud South. A living-room with an open-plan kitchen, a large bedroom leading onto the balcony, a second smaller bedroom, a wardrobe, a bathroom and a shower-room. Both the bedroom and the living-room open on the canal side on a double-balcony done in 2 spaces: a lounge and a dining area. Beautiful view on the canal and the hills.